Hawksnest, St John US Virgin Islands. Courtesy of fensterbme. Even though this is the smallest of the Virgins, 28 square miles in size, many say it is the loveliest. Two thirds of St John is a U.S. National Park, and here you see what the world is like when nature takes care of itself. Friends of the Virgin Islands National Park volunteers staff an information kiosk here. Spend day after day on beach after beach, each with its own panoramic view. Let a friendly mongoose lead you along a woodland trail. Many of them end on a plateaux high in the sky, offering panoramic views of white beaches, emerald cays, and turquoise waters. An enjoyable activity to do either with your family or with your mate is to have a picnic on a beach. Your hotel can help arrange a well packed picnic basket! Sometimes, if you are lucky, you can find a beach on St John that is secluded, and the result can be a nicely romantic afternoon. For a moment you can imagine a life as Darby Shaw! 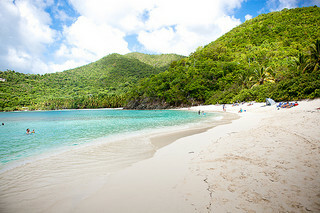 Other activities on St John include the trail to Rams Head on the northeast side of the island contrasts with the normal soft white sand Beaches found elsewhere on St John. You start at the Salt Pond area, going past Trunk Bay on this two hour tour. If you are not accustomed to the heat in the Carribbean, bring sunscreen, water and a hat. Rams Head itself is a tragic location, when in 1733 members of a slave rebellion by Akwamu tribesman faltered and suicide was seen as a better choice then capture. In Cruz Bay there are gift shops and well stocked grocery stores; there are also dive centers and jeep rental services. Once you’ve visited, you’ll know why the natives call Cruz Bay, Love City. If you’re on the Islands for a few days, you can head out from Redhook by ferry to St John and enjoy a dinner within walking distance of the ferry slip. This can be a nice activity to do as a couple as St John’s nightlife is quieter then St Thomas’s. From personal experience, it’s not advisable to over-indulge, the ferry ride home can be rough if you do!